You need to optimize your local SEO. How do you do that when your business has multiple locations? It’s 2018, and over 52% of all Internet traffic is served to mobile devices. What does that number have to do with local SEO? Everything, as it turns out. When you think about how many of us use our smartphones, the explanation behind this becomes more apparent. When we pull out of phone to look up information about a store, restaurant, or other brick-and-mortar business, it’s usually because we intend to visit in person. We’re punching the address into our GPS, checking reviews, or looking at user-submitted pictures. Each of these information points is critical for bridging the gap between the World Wide Web and physical, real-world locations. However, things become more complicated when a business has multiple locations. It’s crucial that users receive accurate information for each business, and just as important to the businesses that they appear in local search results. Fortunately, the Search Engine Powers That Be understand these needs, and have designed ways to address them. Unfortunately, local SEO for multiple locations is largely a matter of repeating your usual local SEO optimizations, but across each of your properties. This means a lot of redundant work, but it’s worth it to improve your location traffic. Here’s how to get started. 1. Create separate location pages. Putting all your location information on one page, even when you have multiple locations, is one of the more common mistakes businesses make. Your stores are different, so each should have their own page, listing their store name, address, and phone number. You can take this a step further by adding location maps, pictures, hours of operation, and staff information on each page. If you have testimonials for your different locations, include those. Use on-page optimization strategies to give each location page unique meat data. 2. Create Google My Business listings for each location. The next step, after creating your location pages, is to list each location separately on Google My Business. Doing so is especially important to help mobile users find your business when they’re browsing locations in Google Maps. It also helps you gain ratings and reviews based on individual locations. The information you include on these pages will be very similar to what you used on your location pages: name, location, hours, phone, website, etc. You will want to include some pictures of your own, but do remember that users will be able to upload their own images and tag them to your location. 3. Audit other popular listing sites to ensure consistency. You may claim your business on Google, but that doesn’t mean it hasn’t been aggregated in other sites. Location listings such as Yelp, Foursquare, and Yellow Pages may also have listings, and they may not match your information. The discrepancies will show up in Google, which will affect your rankings, and it may even cause user confusion. Wondering how you can find out where you’re listed? Well, it never hurts to Google yourself. See where you turn up, and fix any errors you find. You can also check the top location directories manually. This includes the ones we already mentioned, as well as any social media sites (Facebook and LinkedIn, especially). HubSpot has a pretty comprehensive list of major directories that can help you get started. 4. Create a content strategy for each location. Here’s where you can really take your local SEO strategy to the next level: create localized content for each of your stores. Does this mean multiplying your content creation strategy? Yes. But if you have multiple successful branches, your marketing budget can certainly take it. Our preferred method of handling content creation in this way is to have local blog pages for each of your stores. This means that, instead of having one blog page that is the catch-all for all your content, you have separate blog pages for each branch. Each location runs its own posts on sales, marketing campaigns, and local interest pieces. Of course, you can combine this with a larger content strategy for your whole brand. But the more you can create localized blog posts (not to mention local landing pages), the more you can grow your local SEO rankings for each location. 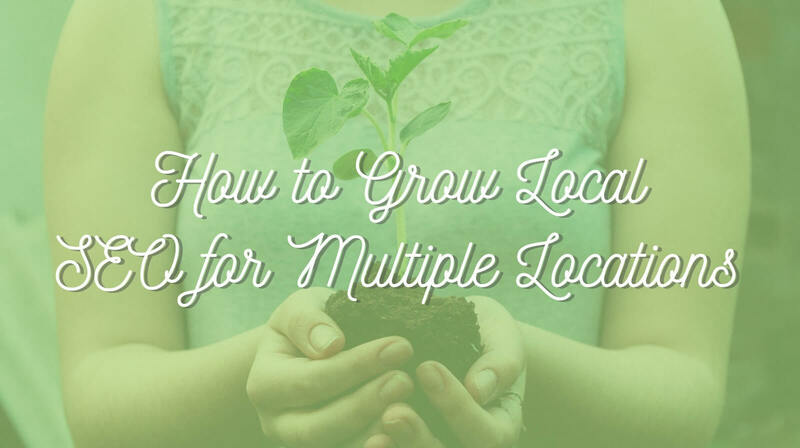 Local SEO for multiple locations is a lot of work, but yields high rewards. If all this seems like a lot of work, that’s because it is. But the results are high, and businesses that invest in it have a lot to gain. As we discussed at the beginning of this post, local SEO is most relevant for mobile users. These are customers looking for a reason to come to your store now, which means they’re ready to buy. Without good local SEO, you could use these customers to your competition. But an optimized page with good reviews and appealing imagery can tip the balance and attract the buyer you need. So, don’t fall behind in your local SEO efforts. And if you need assistance, don’t hesitate to reach out to us.